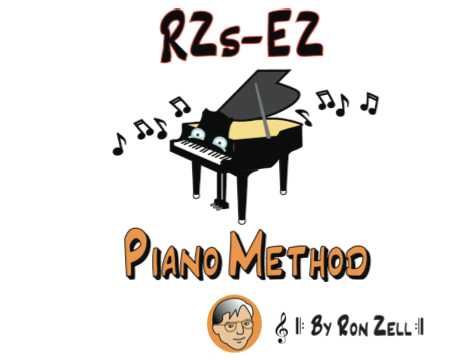 The videos augment the method I developed and used in the upper elementary piano lessons that I have been discussing in depth in my 'Teachers Corner' blog. The method itself is designed as an ebook, to be downloaded and used from any computer, or by printing it, (preferably on card-stock) and having it spiral bound along the top border so that it stands upright on the piano for students to use. In keeping with the philosophy that I have been advocating in this blog and in my teachers blog, the method is also downloadable to an iPad, where it can be opened in the iBook application, and the iPad can be used at the students keyboard. Combined with the instructional video's, which can also be viewed on the iPad, the method is designed to be an alternate to beginning piano lessons for students. 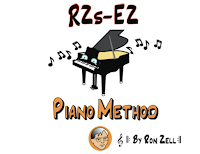 The method will work best with younger students if there is adult involvement, and it obviously works well in the group piano setting that I have been describing in detail in my 'Teachers Corner'. 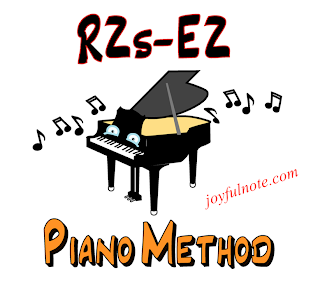 RZ's EZ Piano method is designed to move the student naturally form 'sound' to 'symbol'. In other words, in this first book, the songs used are familiar songs that encourage the student to 'use what they know to help them to grow. A 'song bank' where Sound files for all the songs are available may be accessed at joyfulnote.com and every song in the book may be downloaded, or listened to online. The instructional videos which accompany the course will be released over the next few weeks. Supplemental video reference materials and resources such as 'Flashcards, the Movie' will also be released periodically.